Whether you use social networks for business, pleasure or both, social media manners can play a huge role in the way you or your company comes across. Taking all the major social networks into account, we’ll show you how to perfect your social media etiquette. Running multiple social handles across a variety of platforms can be difficult. Keeping up with the latest trends, and moving in line with the different social norms of each network can become an endless game of catch-up. This struggle can make interaction with followers and fans go a rye, and thus, it is vital that the basic manners of social media become familiar to you. What’s the Need for Social Media Manners? Despite the fluid nature of the Internet and social media, in particular, making up your own rules and regulations when it comes to engaging with others is not a great idea. All types of mannerisms, etiquettes and social norms are embedded into society over time, are the same goes for social media manners. Learning and abiding by such manners will help you to come across more professionally, and avoid looking obnoxious or out-of-place. Essentially, the way you speak online is often just as important as what you are speaking about. We look at the each of the major Social Media networks today and talk about what kind of content is popular on the network, the best timing to engage with people on that specific network, the kind of user base it has and the general Do’s and Don’t. Let’s start with the most popular network of our generation. Facebook is the largest and most active social networking website on the Internet. Sharing your content, opinions, and services is incredibly easy to do. A Simplistic interface paired with some pretty handy marketing tools enables you to establish and grow your brand or personality online. Currently, Facebook is thriving with witty, comical and interesting images. Many popular pages have taken to captioned pictures and popular images from around the web to generate likes, shares, comments and even traffic back to their external websites. On the same lines, infographics are another popular content type that drives the interaction on Facebook. Just like images, they get a lot of shares and comments. Famous and/or witty quotes is also appreciated by many people, whether you are sharing it on your personal profile or Company page. Facebook followed the lead of other Social Networks and recently introduced hashtags. Using hashtags gives a boost to your content as not only the people who follow you but anyone searching for the same topic can view your post. This can lead to improved engagement on your profile or fan page. These techniques have worked wonders for many, and so it would be a great idea to implement above-mentioned strategies in your own Facebook posts. A look at the Facebook Insights over a certain time period will also give you an idea of what content is popular with your community. Here are a few must-read Facebook marketing tips from the top experts in social media marketing. Generally speaking, the best time to post updates on Facebook is between 1 pm to 4 pm, whilst the worst times lie between 8 pm and 8 am. Posting at the right time will ensure that your content is seen by more browsers, and will thus increase your likes, comments, and shares. Posting at the wrong time will not only decrease fan interaction, but will also demonstrate to your followers that you are out of touch with the workings of the social network, especially if you are a brand. Generally speaking, Facebook is more appealing to female users, between the ages of 18 and 29 and 70% of the urban population are active on Social Media sites. Of course, this doesn’t mean that the male gender should be excluded from your statuses or posts, but you can certainly be sure that a large amount of women will be viewing your content. Although these stats vary according to the niche. Facebook’s user base ranges by age greatly, and so it’s important to filter out any content which may be age specific, and offer generic posts and updates which will appeal to all ages. Unless you offer a product or service geared towards a particular demographic, your main concern should be to accommodate all demographics. To help you get the most out of your Facebook statuses, comments and fan base, we have listed some general Facebook dos and don’ts below. Post comical and thought-provoking images to engage your followers and fans. Respond to more private or personal questions via personal messages, and not via your wall. Engage with your following by responding to comments and commenting on their walls or pages. Facebook offers a relaxed atmosphere to its users, so ensure that your tone is always informal. Publicize your personal or private matters publicly. Send friend requests to strangers. Refrain from verbally abusing or mocking others, even when they are being rude. Do not constantly post links or marketing content. Twitter is the second largest social media network in existence – and for good reason. The micro-blogging website allows you to instantly share your thoughts, opinions and business offers in bite-size publications called Tweets. Each tweet can be responded to and re-tweeted by other users, which spreads your content to a wider audience. When it comes to popular content on Twitter, it is vital that you do not indulge in personal rants and comments too often. Twitter has correctly been compared to a giant chat room, and thus the best strategy to adopt, would be to talk about others, as well as relevant issues. Developing a niche will go a long way in getting new followers. Depending on the type of followers you want to attract, you will need to discuss matters based on your common interests. These matters should also relate to you in some way, yet your tone should indicate that you are open to comments, suggestions, and counter-ideas. Sharing your expertise, answering and asking relevant questions, talking about the latest happenings in your area of interest and even posting interesting pictures will lead to increased interaction with your community. If you are an avid Twitter user, chances are they won’t see each and every tweet you post. In such a case repeating certain useful tweets is not a bad idea. Here’s a fantastic article about how Guardian was able to gain 1 Million followers even though it was late to the Twitter party. Some excellent tips about planning your approach. Typically, the best time to post on Twitter is between 1 pm and 3 pm. The worst times to post content is between 8 pm and 9 am. Twitter is an extremely fast-moving social network, and thus it is arguably the social network in which timing is most important. Posting content at incorrect times in relation to your following will render the post almost useless, as it will quite quickly disappear from their Twitter timeline. Twitter, like most social networks, is made up of a wide range of demographics. Primarily, however, Twitter appeals most to adults in general between the ages of 18 and 29, as well as African-Americans. Yet again, however, Twitter is diverse. There are users who young, old, from a corporate background and from a working class background. Therefore, your content should reflect each demographic, and appeal to everybody for gaining a wider following. To help you get the most out of your Tweets and followers, we have listed some general Twitter dos and don’ts below. Tweet informally about general subjects, whilst avoiding topics relating only to yourself. Respond and reply to the Tweets of others, and thank users for engaging with your content. Engage in retweeting and favoriting users who speak about your topic of interest. Politely urge your followers to follow and engage with influential users within your niche or industry. Make sure you have a professional or a decent avatar and an effective bio – sends a signal that you are a serious user. Link your Twitter account to other services like Facebook, Digg etc for increased exposure. Ignore users who have taken time out to Tweet or reply to you. Spam your followers with marketing content and links all the time. Group your Tweets together – space them out instead. Share or discuss your personal or private life in too much detail. Much like Facebook, Google+ enables individual users and companies alike, the opportunity to engage with their friends, fans, and followers. Additionally, actively taking part in Google+ circles and using its features can positively affect your website’s search engine ranking. The “like” equivalent, the “+1” button, which can help a page to rank higher in Google’s algorithm. Google+ is all about interacting with your circles. Circles are made up of other users who wish to view and engage with your posts and updates. likewise, adding other users to your circles will enable you to engage with their content. It’s important to post good content, and also to +1 the content of others. Generally, Google+ allows you to share content in a way which is similar to Facebook. Images, links, text statuses and even GIFs can be shared for your following to see. Your content is displayed via tiles which are spread neatly across your profile page. Naturally, it is your job to help keep it neat by offering a variety of content in a range of formats. Witty quotes and pictures, puzzles, Productivity tips, Mini Games seem to work wonders with the Google+ crowd. The Google+ Communities are another excellent places to participate in meaningful discussions. If you are interesting and helpful you will definitely make new friends and gain new followers. If you have used Social Media for a while, you must have definitely heard about Guy Kawasaki. He’s the former Chief Evangelist of Apple and co-founder of Alltop.com. He has some excellent tips about using Google+ better. Also, if you are in a mood to read more about how Google+ has improved over the years check out our article about 7 Things Google+ does better than Facebook. The best time to post on Google+ is between 9 am and 11 am, whilst the worst times lie between 6 pm to 8 am. However, unlike Twitter, content which has been posted many hours ago is usually easy to access, as the tiling system used to present the shared content of your circles allows a lot of updates to be displayed at once, in a small amount of space. Google+ has over 500 million members, which is made up of a variety of users, who are usually interested in technology and the Internet as a whole. Of course, this doesn’t mean that other topics are not discussed and shared, so it is vital that you join the right circles, and share relevant content. Also, Google+ allows you to share particular content with particular circles. Thus, any content which is irrelevant to a particular circle, should not be shared with them. This helps with user engagement and meets the general etiquette standards of Google+. To help you get the most out of your Google Circles and shared content, we have listed some general Google+ dos and don’ts below. Use images link GIFs and text to diversify your content output. Share different types of content with different circles to ensure relevance. Respond to comments and +1 the updates of your following. Participate in community discussions, offering useful and interesting insights. Re-share the private or personal updates of your following on a more public scale. Continuously put out similarly formatted updates, as this will become extremely apparent when somebody visits your profile. Run contests or promotions via your profile, as this is prohibited by Google+. Share all of your content with all of your different circles. Pinterest is an image board based social network, thriving with content. You can use your very own pin boards to pin-up and re-pin images from URLs, your computer, your mobile device, or from other Pinterest users. 57% of content on Pinterest is food related, making it a hot bed of amateur and professional cooks and chefs. Naturally, there is plenty of room for different images. Categories related to sport, nature, technology and more are all healthily followed via Pinterest. Pinterest allows you to share a wide range of images, yet keep them grouped via separate boards. Your followers can then choose to follow each individual board. Keeping separate Pinterest boards for different types of images can help greatly when it comes to offering relevant content to different groups of people. Search Engine Journal has some tips that’ll help you improve your presence on the social network. The two best times to post images on Pinterest is between 2 pm and 4 pm, and 8 pm to 1 am. These times mark the periods within which Pinterest is most active, and re-pins are most prevalent. The worst time to post on Pinterest is between 5 pm and 7 pm. Posting in this time will increase the risk of your content going unnoticed, as many users enjoy posting large-scale images, which can push your content far down the Pinterest feed of your followers. Pinterest appeals to women on a monumental scale. In fact, around 80% of Pinterest users are woman below the age of 50. Bearing this statistic in mind, it would be wise to gear much of your content towards women, and avoid overly masculine images. However, as previously mentioned, there is a place for many different categories of images on Pinterest, and so utilizing different Pinterest pin boards to house a diverse range of images would be a great idea to keep your followers and fans happy. To help you get the most out of your Pin Boards, Pins and Re-Pins, we have listed some general Pinterest dos and don’ts below. Offer a healthy amount of images that are appealing to women, or that are not gender specific. Use different pin boards to categorize different types of images, which will make sure relevancy and keep users engaged. Pin a variety of images, from useful, to beautiful, to comical. Comment and Re-Pin the images of other relevant users. Steal images from other users or websites, as copyright laws exist on Pinterest. Share inappropriate or indecent images. Upload images that are too small or too large, as this can frustrate your followers. Out of all the social networks in existence, LinkedIn is the place where you’ll want to present yourself as professionally and as formally as possible. Unlike Twitter and Facebook, LinkedIn is a place for primarily marketing yourself or your brand, without shame. The community is held together with connections and groups, whilst allowing users to “Endorse” each other’s skills. The content shared on LinkedIn varies a great deal, depending on the profession or industry of the user. If, for example, you design electronics, you will want to publish news and views about this topic only. Personal and private rants or opinions should not be voiced via LinkedIn. LinkedIn also allows you to join groups, which can be dedicated to a particular topic. You may then choose to share your views and content with either your general connections or that particular group of people. This will allow you to keep your content relevant. Here’s an excellent case study at Social Media Examiner which details how LinkedIn is powerful enough to allow some users to grow their business entirely from this Social Network itself. Between 7 am and 9 am, and 5 pm to 6 pm is the best time to post on LinkedIn. Additionally, posting between 10 pm and 6 am is probably the worst time to do so. However, LinkedIn’s professional atmosphere means that content is not constantly flowing. Unlike Twitter, LinkedIn allows you to share content knowing that it will most likely be seen by the majority of your group or connections. However, sticking to the most popular times is never a bad idea. Naturally, LinkedIn is filled to the brim with executives, professionals and aspiring business people. There is very little room for youngsters who wish to discuss the latest sporting events or TV shows, and this should be greatly reflected in your tone and content. Restrict yourself to an extremely formal, yet friendly approach, offering sound content and views. Such a strategy will ensure that your connections begin to respect and trust your updates. Present yourself professionally, and honestly. Readily endorse the skills of your colleagues, friends or family. Offer sound, relevant content to your connections. Engage in discussions held in LinkedIn groups. Endorse the skills of a user you have never worked or spoken with. Publish personal, private or unprofessional views or statements. Bombard users with marketing content or sales pitches. Be unfriendly or unapproachable. Instead, maintain a formal, yet welcoming tone. The art of good interaction on social media is all about manners. Without practicing the proper etiquettes of each network, you may well find yourself being identified as a user who is out of touch with their following. 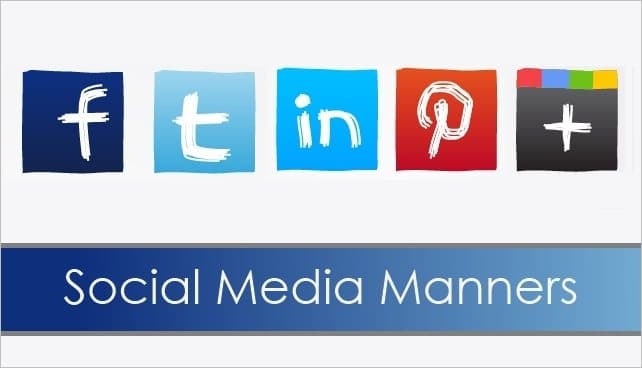 In order to maintain a close, personal relationship with your online followers and fans, social media manners and etiquettes need to be followed closely, and the tips listed above for each platform will certainly help you along the way.